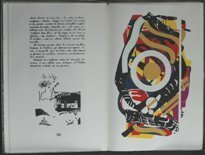 Dissonances: text and part of the illustrations by Denis Schneider using a technique called silk screen printing on Velin Cuve bfk Rives. The cover is made of zinc, lined with silk. Artist draws. 52×34 – 1972 – 25 copies. 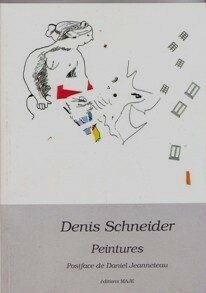 Denis Schneider Peintures: published by MAJE – 1999. 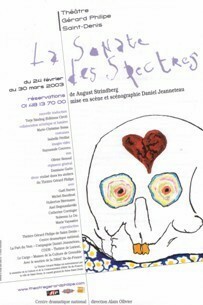 68 pages with 32 pictures of his paintings. book jackets and CD inlays…. 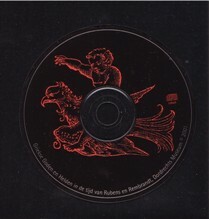 In 2001 the Dordrecht Museum (Netherlands) released a CD-ROM to mark an exhibition on the topic “The Greek Gods and Heroes in Rubens and Rembrandt’s time”. Two contemporary paintings had been chosen to illustrate this theme: “ORPHEUS” by Cy Twombly and “ORPHEE” by Denis Schneider.